Who LOVES portobellos? I DO, I DO! And, who says vegans can’t enjoy A-1 Steak Sauce? Not me! Even though it says “steak” right there in it’s name, it is in fact, vegan! 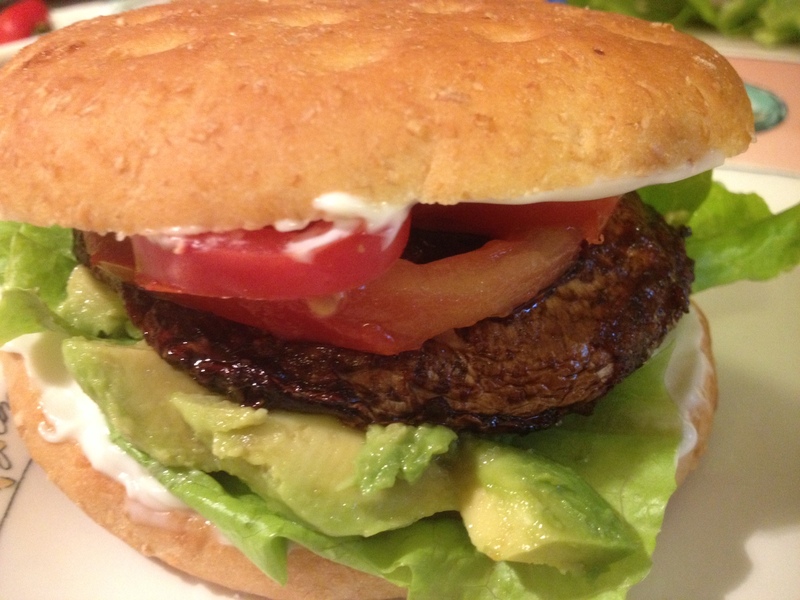 Use it on veggie burgers or this grilled portobello for a meaty taste, that’s tender & juicy, without the meat! If you’re one of those weird people, like my hubby, who doesn’t like mushrooms, sub 1/4″ slices of extra firm tofu instead – just remember to squeeze out as much water as possible before marinating ! In a shallow dish, mix together steak sauce, worcestershire sauce, soy sauce, garlic, and ground pepper. Add mushrooms and toss gently to coat both sides. Allow to marinate for at least 30 minutes. Or, put it in the fridge if you won’t be using grilling within 30 minutes. Grill for 5-6 minutes each side or until desired doneness. Throw it on a bun with your favorite toppings. I like vegenaise, lettuce, tomato, and avocado! YUM!